We just got back from a trip to one of our favorite cities: Nashville! We've been a few times now, we visit for Porter Flea every summer – and we figured it was high time we share some of our must-do's and must-try's with you! Nashville is a bustling and fun city full of delicious food, drinks, culture, and southern charm. Traveling there soon? We hope our guide will help you find some incredible spots to make your trip more special. We know we're already counting down until the next time we can go! You can't start a trip off right without some GOOD coffee. 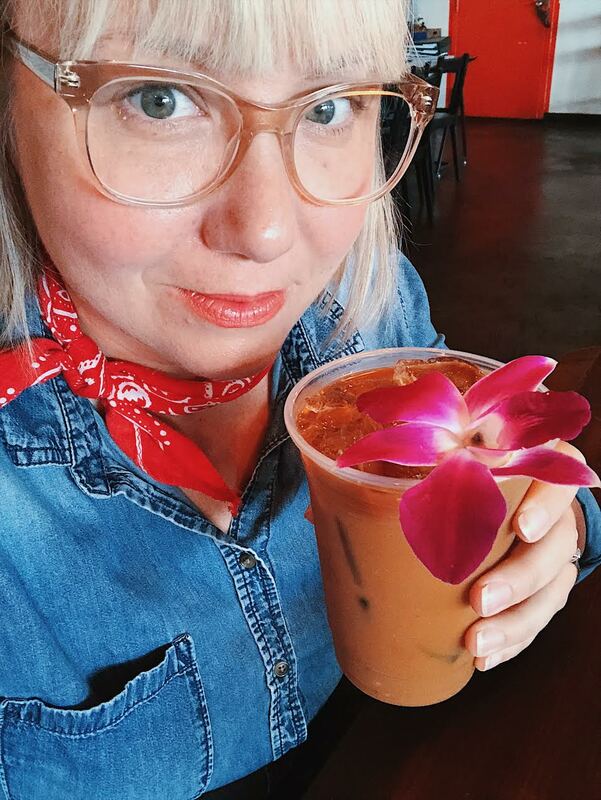 We found a few coffee shops that were great, but our two favorites are Barista Parlor, and Crema. Barista Parlor (pictured above) in East Nashville is an unassuming find that is located in a old renovated car garage with lots of industrial accents. There is nothing unassuming about the coffee however; we've found our favorite coffee lattes here many times over! This time we got to try the Thai Lemongrass latte with perfectly made espresso, condensed milk, and a homemade lemongrass syrup. But that deliciousness aside, would ya just look at that beautiful orchid they used as a garnish? One of our favorite moments of the trip had us stopping at Crema for a homemade chai latte and heading over to Centennial Park for a chill morning underneath the shade of a tree and views of the Parthenon. Ya'll know food is our MOST favorite part, right?! It's basically a pastime and sport in one over here. We've included some of the BEST places to get food that'll have you going back to Nashville over and over again for more. Some are old Nashville institutions, most have you waiting in line, but ALL are worth it. We headed here our first night in Nashville after a long day of driving for a festive pick-me-up. This taco dive is an annual haunt for us with fried plantains you can eat like candy, fried avocado tacos, homemade tortilla soup, and margaritas (we got ours smoky with mezcal). They even have quick pickled carrots, onions, and jalapeños! Everything is made by hand and you can tell by the freshness, flavor, and insane popularity! Just don't forget your cash, like we did! Dino's is Nashville's oldest dive bar with the most delicious late night eats. If you aren't getting the cheeseburger, you aren't living! Dino's is a must-do if you're looking for an easy brunch on the weekends, casual drunk munchies, or anything in between. Hot chicken is a Nashville institute on its own, but Prince's Hot Chicken is the best version of it. Prince's is an original and the batter and spices cannot be beat by any other hot chicken joint in the city. The line may be long, but the chicken is well worth it! We're pretty sure you can tell by the name that you're going to love it! It's everything you want country family comfort food to be! Arnold's features a meat and 3 offering. As you go through a cafeteria style buffet, you choose one meat, and three southern perfected sides. As if you need any more convincing, Arnold's received the James Beard American Classics Award in 2009! Hattie B's is another well known hot chicken institution in Nashville. While it is more commercialized than all of the others, we have no regrets about waiting in line. This chicken is fried to crispy perfection, and all of the sides are fantastic; hello pimento mac & cheese! And if you're brave enough to try Hattie B's special sauce, let us just warn you from experience, there's nothing hotter on this earth! Proceed with 911 on speed dial! What would a trip to Nashville be without experiencing some honky tonk on Broadway? We listed our two favorite bars from our day out on the town. If you're ready for a good time then Tootsie's is your place. This honky tonk bar has 3 levels of constant live music! We really loved the top level where everyone was dancing and singing with the full band taking requests. While everyone was so talented, the fiddler on the bar could have kept us there for hours! This bar really had us in love. Robert's Western World is a much more relaxed scene. Old cowboy boots line the walls, and signed photographs and dollar bills fill the empty spaces. We couldn't get enough of the band that was playing! We got to hear original songs, folk tunes, classics, and even some Cajun. That about wraps it up! We hope we've given you some ideas on what to do in Nashville, or inspired you to visit! We wanna know! Have you been to Nashville? What were some of your favorite spots to visit?